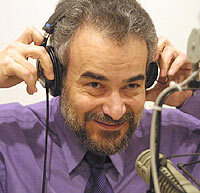 New York City radio icon Pete Fornatale passed away on April 26, 2012. He was 66, born August 23, 1945. He earned his celebrity in multiple disciplines as Disc Jockey, Rock Historian, and Author. His beginnings in radio date back to Fordham University and WFUV-FM in 1964 where he was on the cutting edge of progressive FM radio. Fornatale moved to WNEW-FM in 1969. But Fornatale also embraced the early sounds of Top 40 radio, and most importantly, he had a passion to preserve and present the history of rock music radio. This aircheck of his WFUV Mixed Bag program from January 26, 2002, is dedicated to radio, and was broadcast on the first anniversary of his return to WFUV. It is presented, in Pete's words, to remind us of what radio could be. The program is presented in three parts, corresponding to the original three hours. Part One focuses on radio in general, Part Two is themed for FM radio, and Part Three is dedicated to Fornatale's favorite radio moments from other media. Because the MUSIC was such an important part of Fornatale's program, and because he integrated music with other media, we are not providing telescoped versions of this exhibit. This is the complete program, in STEREO, and it includes all three hours, as described below. Total running time is 2 hours and 57 minutes. The program opens with an excellent montage of radio songs, followed by a radio song set that for many Top 40 listeners will be all "new" music! Guglielmo Marconi, Jack Benny, Orson Welles and early Westinghouse broadcasts are featured, and an interview with Paul Simon reminds us of the great variety that was once available on free-market regulated radio. Also, Bill Cosby tells a horrifying tale of a radio monster. Pete Fornatale dedicates the hour to FM radio, and presents an incredibly moving recording of the late Bill 'Rosko' Mercer reading a Pete Hamill column on The Effects of War from The New York Post. Allison Steele is featured, followed by Mike Agranoff who reads his poem, The Sandman. Pete editorializes on the condition of broadcast ownership consolidation that followed the 1996 Telecomm Act, calling the result McRadio for the Masses. Ooops! Somehow, one of the songs in the first set is the wrong one, and it's obvious because it has nothing to do with radio. Pete Fornatale suggests that the mistake will be repaired on WFUV's online version, but since this was recorded from the air, the mistake remains. However, there's no mistake with the inclusion of the classic scene from American Graffitti featuring Richard Dreyfus and Wolfman Jack. Also, several NAB Who Listens To Radio spots from Stan Freberg are featured. The program concludes with Ghosts of Radio's Past, featured at REELRADIO since November 1997 as "New York City 1960's Composite".